My recent days of night dev has been a bit fragmented due to the fact that I have two newborn kids that require a lot of attention. But whenever I get a spare moment I try to do a little bit of programming, so todays post is actually the result of several short days of work. First of all I needed to read up on plasma effects again. Haven’t done that in several years, and it turned out I did not fully remember how it was done. After that I started playing with shaderToy, trying to get a plasma shader running. 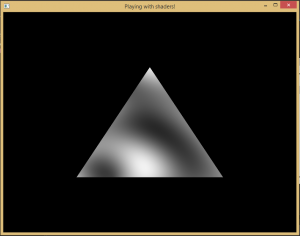 And lastly, I implemented that shader into my c++ sandbox project. Something seems to be a bit off though, it is way to bright. I think it is because the range of each sine/cos-effect (that is merged together to form the plasma) has an incorrect range (not 0-1), or perhaps the area is too zoomed in – but it’s too late to start bug-hunting now so this will have to do for now. Next up: colors and bitmaps!